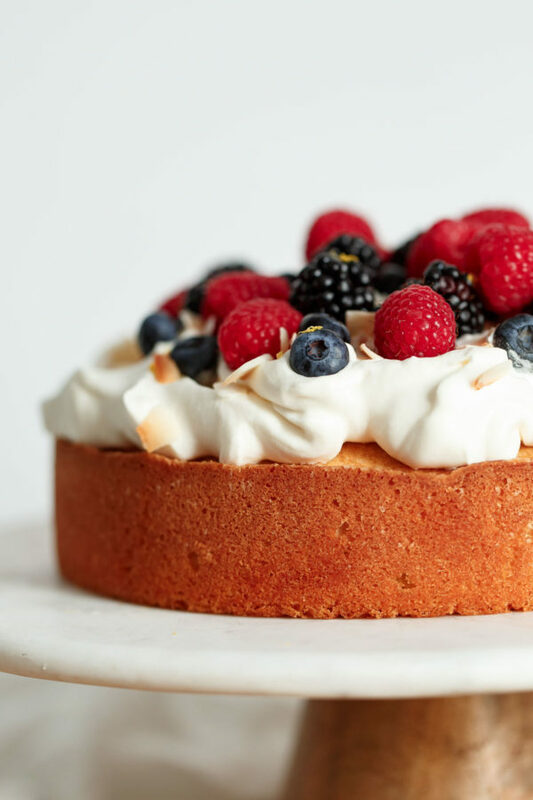 Lemon coconut cake topped with lightly sweetened whipped cream and fresh mixed berries. This simple celebration cake for spring is elegant, flavorful, and comes together quickly. Watch it come together in the video below! If you’re looking for a festive Easter celebration cake, look no further! 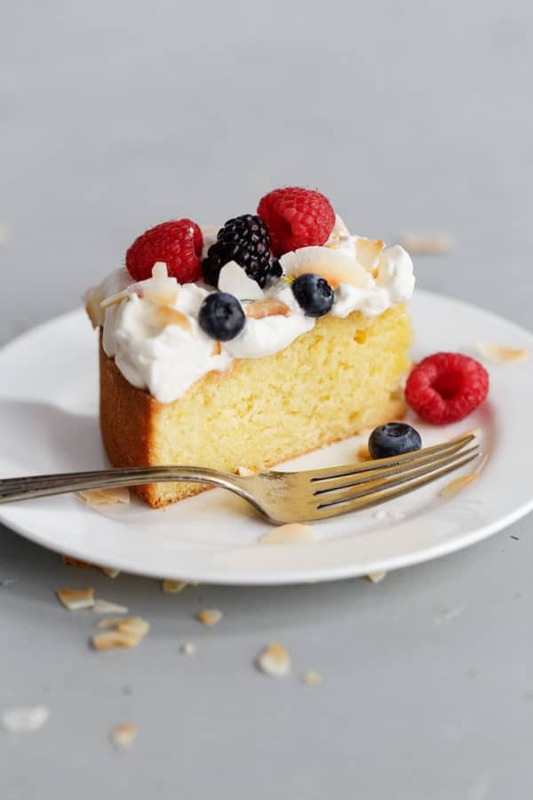 This Lemon Coconut Cake is easy to assemble and comes together quickly! 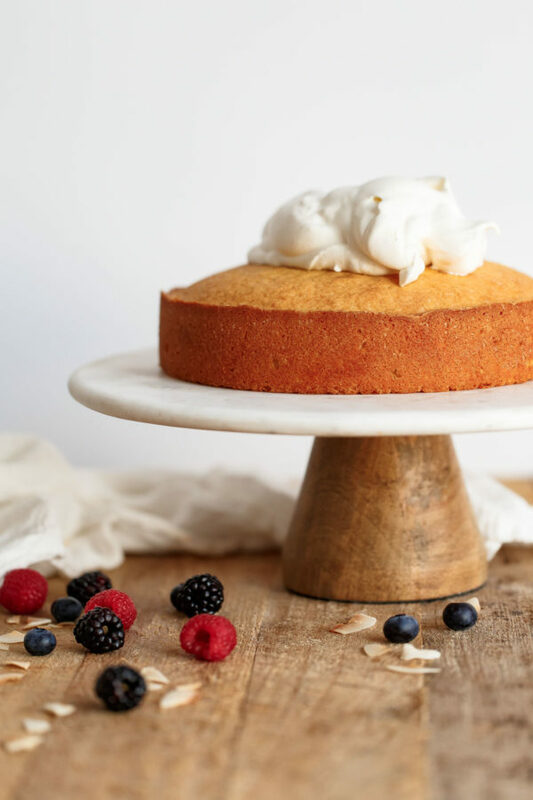 While I love a good old-fashioned layer cake, this simple lemon coconut cake proves that you can create an equally elegant cake with just one cake layer. 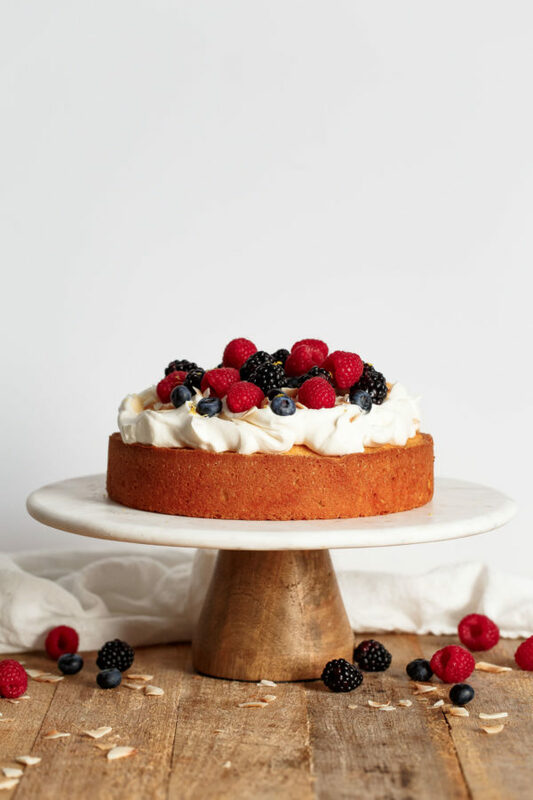 We’re pulling out all of the stops with a simple whipped cream frosting and a generous sprinkling of mixed berries, toasted coconut flakes, and grated lemon zest. 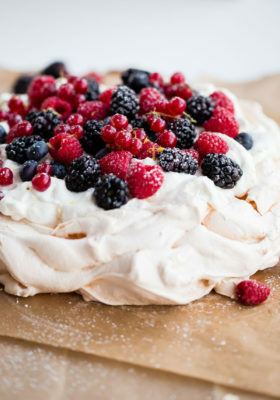 I have always loved the delicate sweetness and texture of whipped cream frosting. It provides just a touch of sweetness (traditional frosting would be far too sweet for this particular cake!) and complements the fluffy, yet slightly denser crumb. 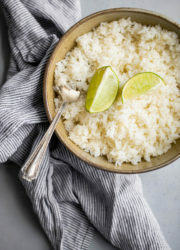 It also allows the fresh lemon and coconut flavor to remain front and center. The fresh mixed berries, while slightly out of season, add a fresh and tart element that can’t be beat. My infatuation with these types of desserts knows no bounds. 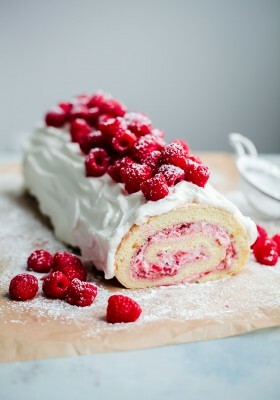 Remember this raspberry roll cake and berry pavlova? I just can’t quit. To achieve a delicate, tender crumb, this lemon coconut cake is made with unbleached all purpose flour. You won’t need to run out to buy any specialty flours for this recipe. While I love to work with whole grain flours, you’ll always find unbleached all purpose flour in my pantry. As the name suggests, all purpose flours are designed to be used for all types of baking. It produces incredibly consistent results. 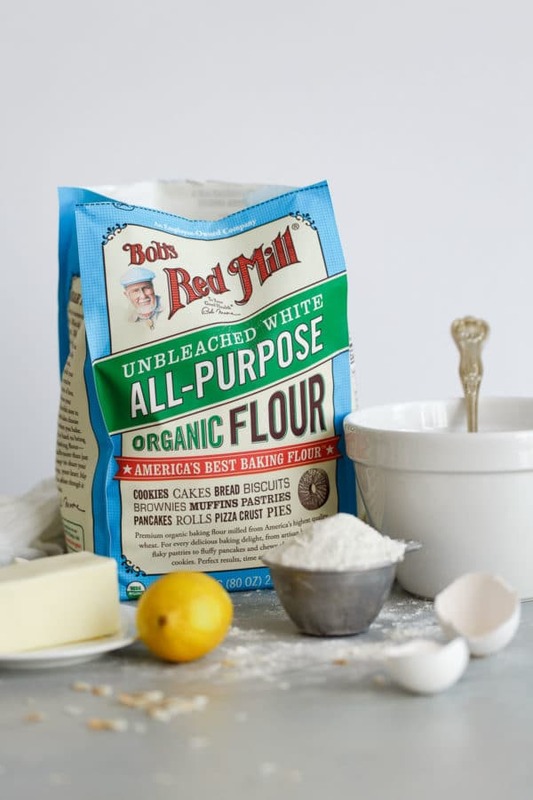 My favorite brand is Bob’s Red Mill Organic Unbleached All Purpose Flour, because it is always unbleached (did you know that most flour bleaching chemicals are banned outside the United States?) and is produced from certified organic red wheat. In other words, wheat that has not be treated with any chemical pesticides. Unbleached all purpose flour is refined, which means that the bran and germ are removed during milling. 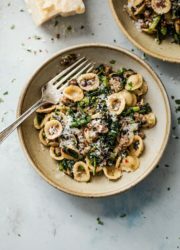 This produces a flour that has a longer shelf life, is lighter in color, delicate in flavor, and has a mid-level protein amount that lends itself well to most baking applications. You can read more about the different types of baking flour here. 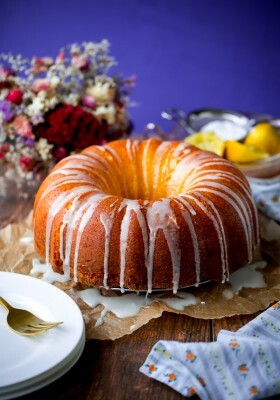 Lemon is the dominant flavor in this cake with coconut playing a supporting role. 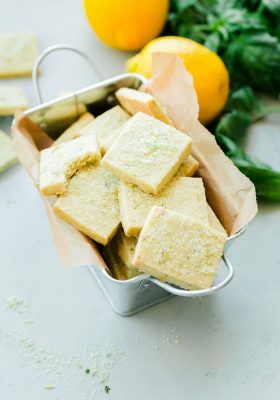 The lemon flavor comes from fresh lemon zest, which is infused in the granulated sugar. The coconut flavor comes from full-fat coconut milk, as well as a touch of coconut extract. 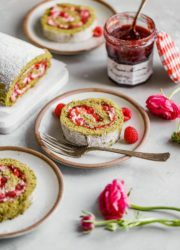 The cake is garnished with toasted unsweetened coconut flakes and fresh lemon zest for texture, color, and as a way to provide a visual clue to the flavor of the cake. 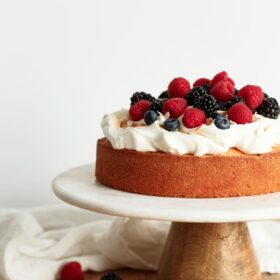 I love to use a mixture of various berries, including blueberries, blackberries, and raspberries, but feel free to decorate this cake with just one, two, or some other combination of fresh fruit. Try your best to avoid fruit (such as strawberries) that have higher moisture levels and might lead to seeping. This cake is an all-butter cake, which means that it has incredible flavor, but is best served the day it is baked. As with all cake recipes, it is very important that your ingredients be at room temperature before starting. If any of your ingredients are too cold (eg. the unsalted butter, eggs, etc. ), they will not incorporate evenly and this will result in a denser cake. Be sure to cream the butter and sugar for the time listed in the recipe. This physical beating helps incorporate air into the final cake batter, which helps produce a light and delicate cake. Prepare the Cake: Preheat the oven to 350 degrees Fahrenheit (175 C) with a rack in the center position. Generously grease one (8-inch; 2-inches deep) cake pan with baking spray. Set aside. In a medium bowl, whisk together the all purpose flour, baking powder, and salt. Set aside. In small bowl, combine the sugar and lemon zest. 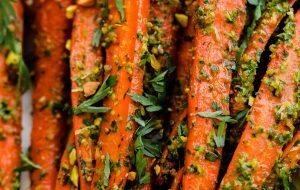 Rub the sugar and lemon zest together until fragrant and moist. Set aside. 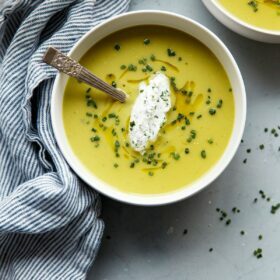 In the bowl of a stand mixer fitted with a paddle attachment (or in a large mixing bowl using a hand-held mixer), beat the butter on medium-high speed for about 30 seconds or until smooth and creamy. With the mixer on, slowly add the sugar mixture and continue beating on medium-high speed for 3 to 5 minutes, or light and fluffy. Scrape down the sides of the bowl with a spatula to ensure all of the ingredients have incorporated evenly. Reduce the mixer speed to low and slowly add the eggs one at a time. Allow each egg to become mostly incorporated before adding another. Add the vanilla extract and coconut extract and mix until combined. Stop the mixer and scrape down the bowl. The batter will look slightly curdled and broken. Don’t worry. With the stand mixer on low, slowly add the flour mixture in three parts, alternating with two additions of coconut milk , beginning and ending with the flour mixture. Once the last of the flour has just been absorbed, turn off the stand mixer. Scrape down the bowl and fold the batter once or twice to ensure all of the ingredients are evenly incorporated. The batter will be fairly thick. Transfer the batter into the greased cake pan. Smooth the top with an offset spatula. 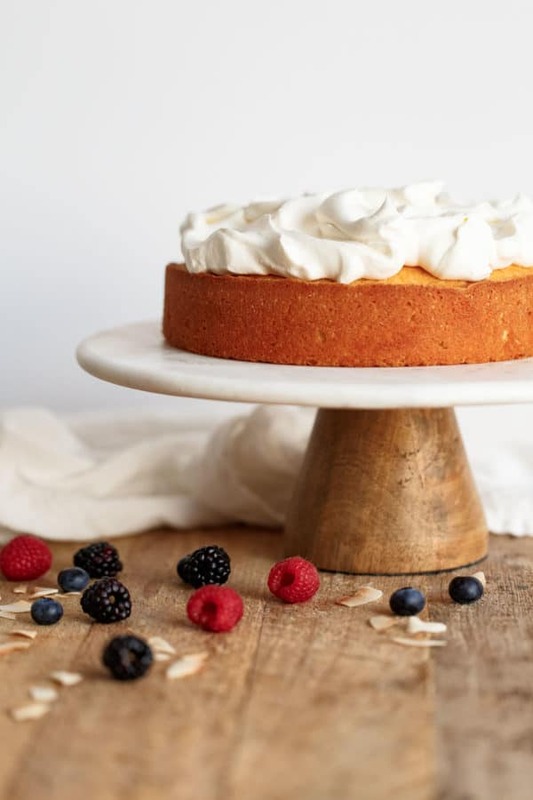 Bake at 350 F degrees for 36 to 42 minutes (*start checking the cake after 30+ minutes and watch carefully from this point on) or until the cake is golden and domed in the center, and a toothpick inserted in the center of the cake comes out clean. Let the cake cool in the pan on wire rack for 10 minutes, then carefully invert the cake onto the rack. Carefully flip once again and allow the cake to cool completely before decorating. Prepare the Whipped Cream: Just before serving, place cold cream in a clean stand mixer bowl fitted with a whisk attachment, or in a medium bowl using a hand-held mixer (*if you can, chill the bowl ahead of time as well; cold cream and chilled equipment will speed up the whipping time and improve the volume). Starting at low speed, start whipping the cream. Increase the speed slowly from medium to medium-high speed until the cream begins to thicken slightly. Add the granulated sugar and vanilla extract. Continue whipping until the cream reaches soft to medium peaks. Do not over whip. Assemble and Decorate: *See notes below on ways to prep this cake in advance. 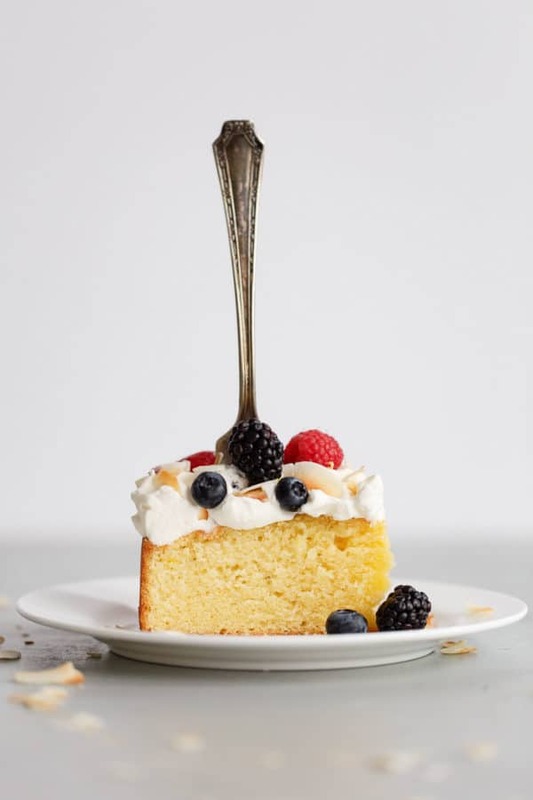 Top the cake with the whipped cream, keeping it in one thick, fluffy layer and creating swoops and swirls with an offset spatula. Garnish with mixed berries, toasted coconut flakes, and freshly grated lemon zest. Serve immediately. 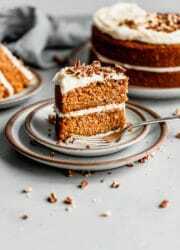 Tip: This cake is best served the day it is made; however, if you wish to prep it ahead, you can bake the cake the day before serving (the whipped cream should be prepared very close to serving). Allow the cake to cool completely. Wrap tightly in plastic wrap (two layers is best) and store at room temperature. 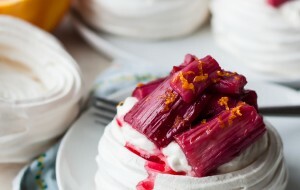 The whipped cream should be prepared just before serving (or up to 2 hours in advance and kept in a separate covered bowl in the refrigerator). 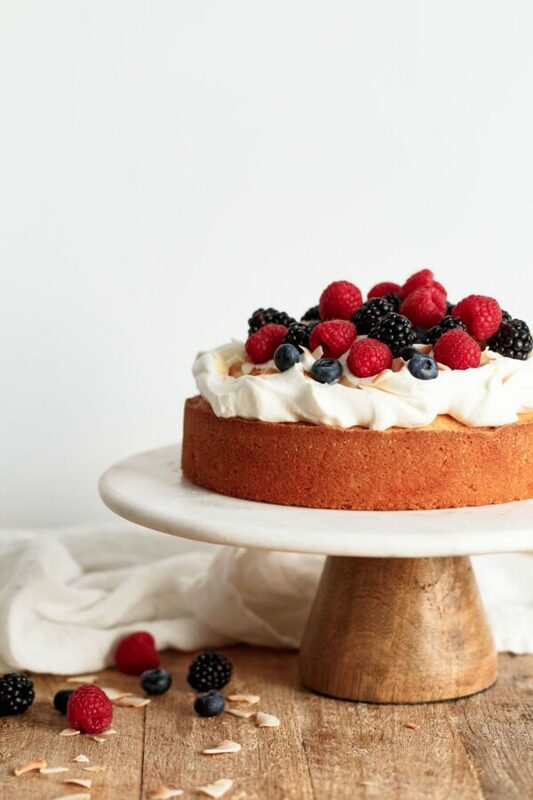 Decorate the cake with the whipped cream, berries, and garnishes just before serving. How to Toast Coconut Flakes – Spread evenly on a sheet pan. Bake at 350 for 3 to 5 minutes, flipping and tossing the coconut flakes until lightly golden in color. Transfer to a separate container and allow to cool before using. This post is sponsored by Bob’s Red Mill. Thank you for supporting brands I love and use in my kitchen. Check out more delicious healthy recipes, snag coupons, and find stores near you at BobsRedMill.com! Love the video! 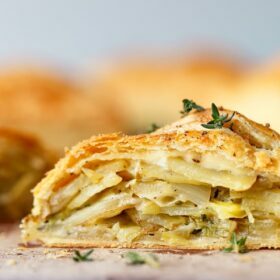 Can’t wait to try making this it looks delicious! So glad you enjoyed the video! Thank you so much! This looks spectacular! I may make this on the weekend. I also love the video! Granny would have loved this “all butter” cake! I made this cake this morning for Easter and got rave reviews. The perfect spring dessert and one that’s sure to impress. The cake had the “essence” of lemon and coconut without being overpowering. The final product was a delicious butter cake like dessert, very moist. A couple quick notes, I took my cake out at 32 minutes, but plan to take it out at 31 minutes next time; I realized that I do need an offset spatula to spread the batter evenly across the middle and sides (to make sure there’s equal parts batter to help prevent the sides from getting done too quickly); I used European butter which is always dreamy for a recipe like this. It take some time to prepare, but we’ll worth the effort! So happy for the feedback Lisa! I’m so glad that you enjoyed it! Also, thanks for the note regarding the bake time, that’s partially why I put that extra note in the instructions. Cakes will really bake differently depending on the color of the cake pan that they’re baked in, whether or not everyone’s oven temperature is the same, etc. Also, love the European butter addition – I can imagine how great that tastes. Thank you again!!! Can I make this into cupcake version? Hi Kimberly! I haven’t personally done this – and am a little hesitant to advise it, because it’s a denser batter and I just don’t know if it would bake up as properly (or be as moist) if it was cooked in small amounts. I might have to test it before I can tell you for sure! You could totally find another vanilla cupcake batter recipe and use this same topping though! This looks like the perfect dessert to make all summer long. Delicious flavor, whipped cream, and mixed berries with a hint of coconut. Yes, please! Beautiful. I must make this one, too! Amazing lemon flavor in the cake. 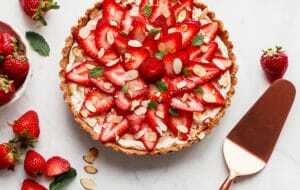 This is a perfect dessert for this summer.Thanks for sharing the wonderful recipe.